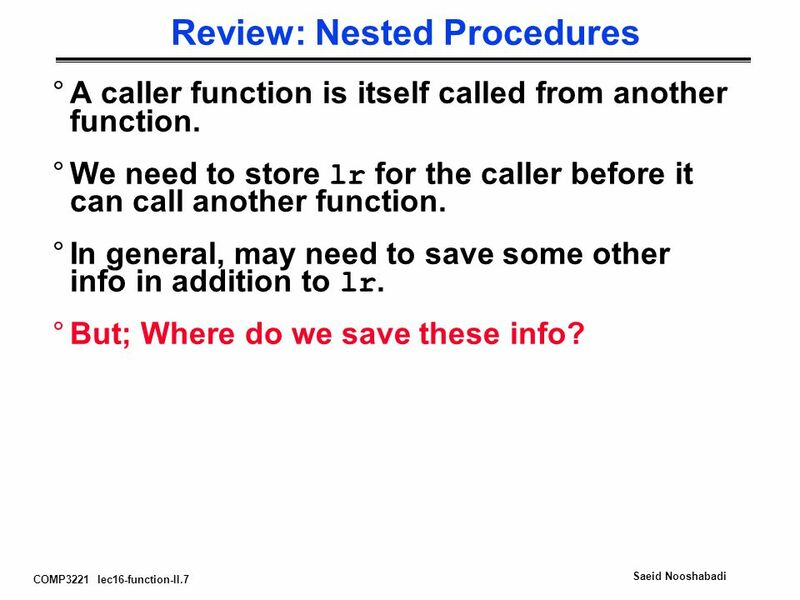 7 COMP3221 lec16-function-II.7 Saeid Nooshabadi Review: Nested Procedures °A caller function is itself called from another function. 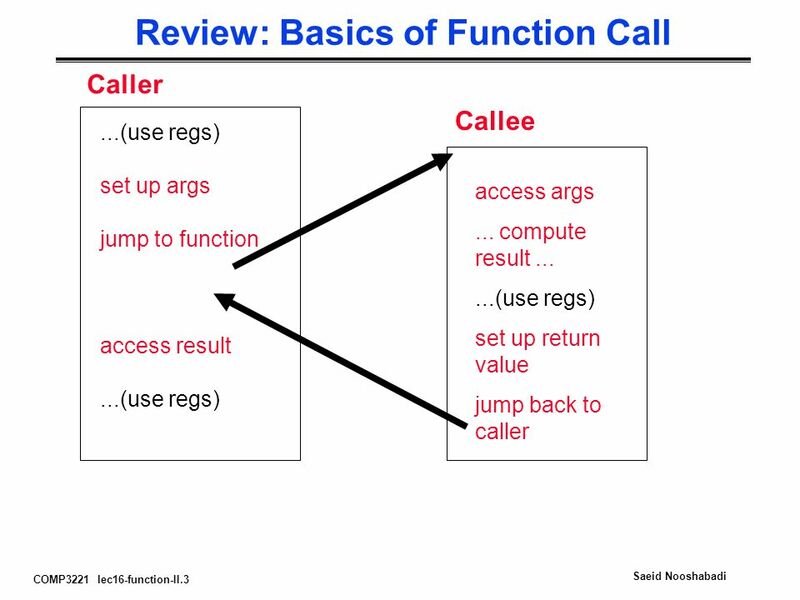 °We need to store lr for the caller before it can call another function. 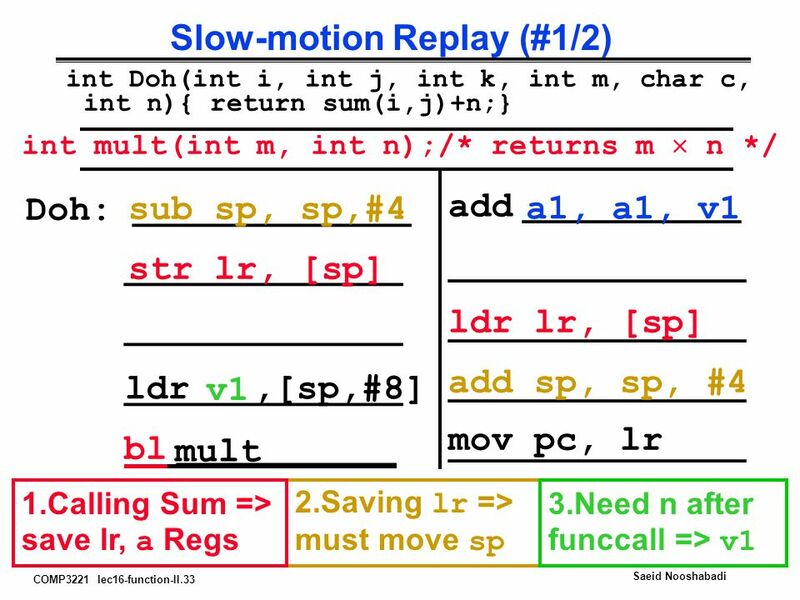 °In general, may need to save some other info in addition to lr. 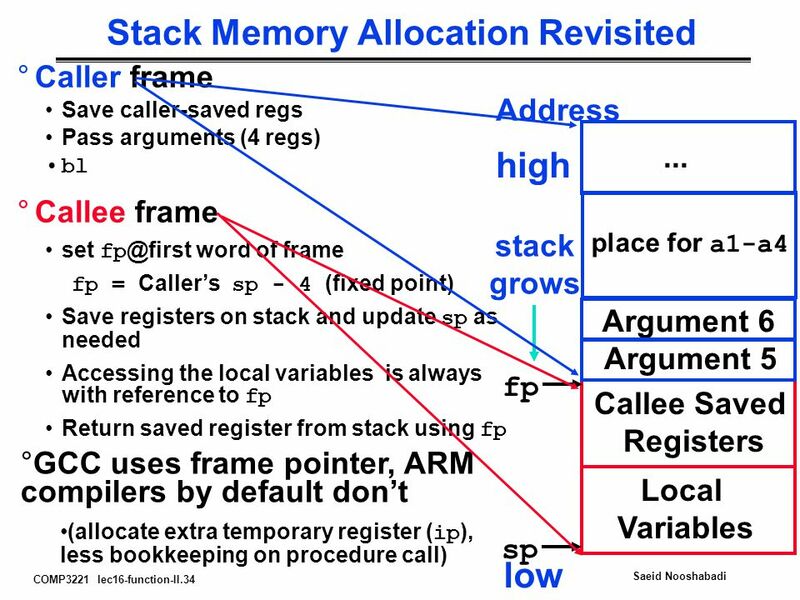 °But; Where do we save these info? 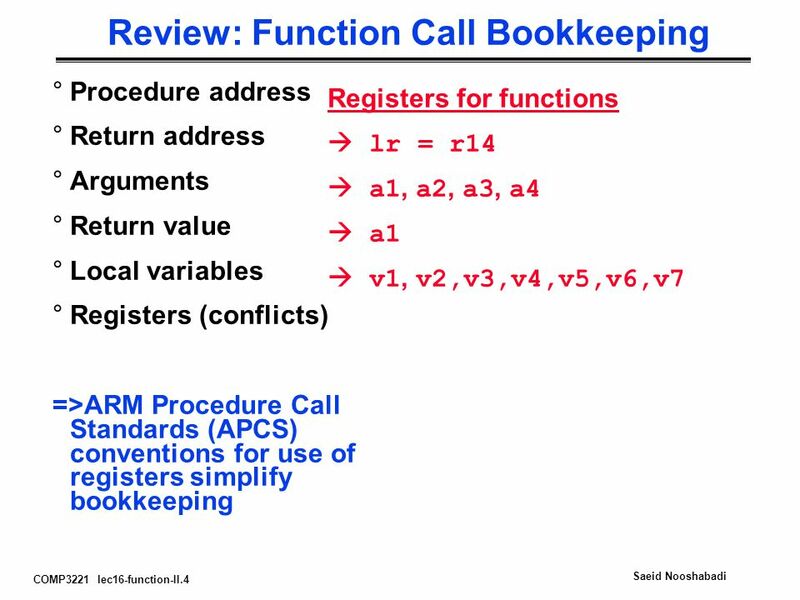 13 COMP3221 lec16-function-II.13 Saeid Nooshabadi Function Call Bookkeeping: thus far °Procedure addressx °Return address xlr °Arguments xa1 – a4 °Return values xa1 – a4 °Local variables xv1 – v8 °Registers what if they are reused? 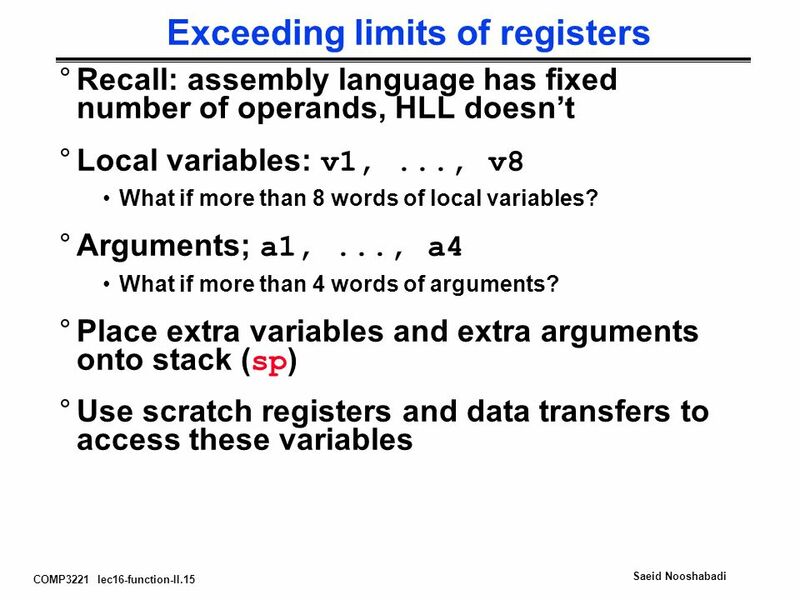 what if there aren’t enough? 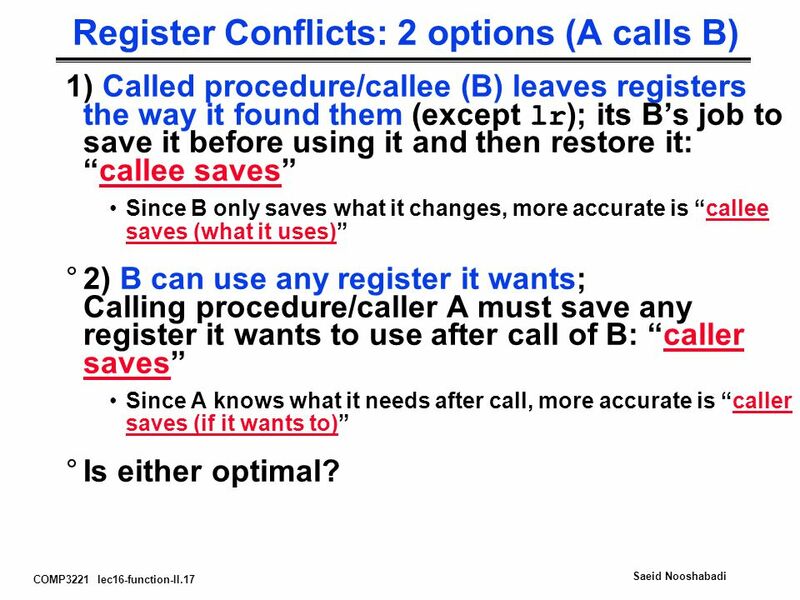 17 COMP3221 lec16-function-II.17 Saeid Nooshabadi Register Conflicts: 2 options (A calls B) 1) Called procedure/callee (B) leaves registers the way it found them (except lr ); its B’s job to save it before using it and then restore it: “callee saves” Since B only saves what it changes, more accurate is “callee saves (what it uses)” °2) B can use any register it wants; Calling procedure/caller A must save any register it wants to use after call of B: “caller saves” Since A knows what it needs after call, more accurate is “caller saves (if it wants to)” °Is either optimal? 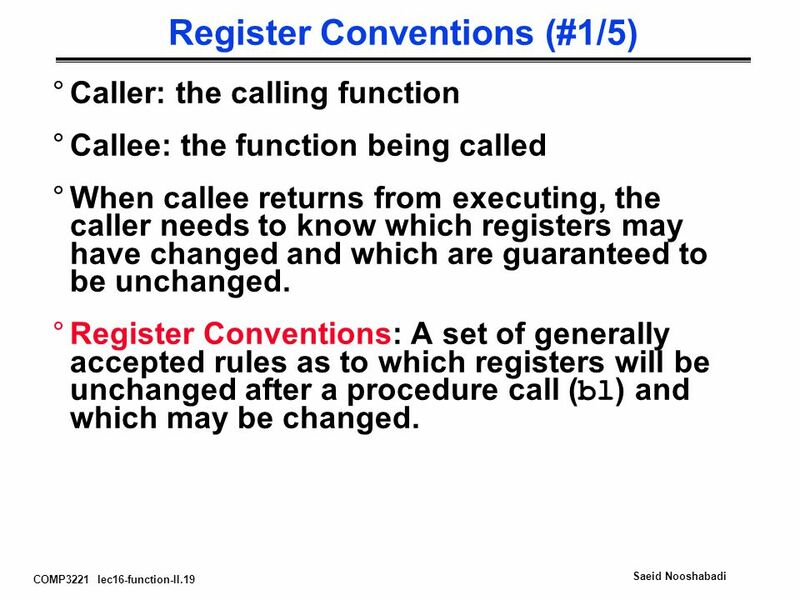 19 COMP3221 lec16-function-II.19 Saeid Nooshabadi Register Conventions (#1/5) °Caller: the calling function °Callee: the function being called °When callee returns from executing, the caller needs to know which registers may have changed and which are guaranteed to be unchanged. 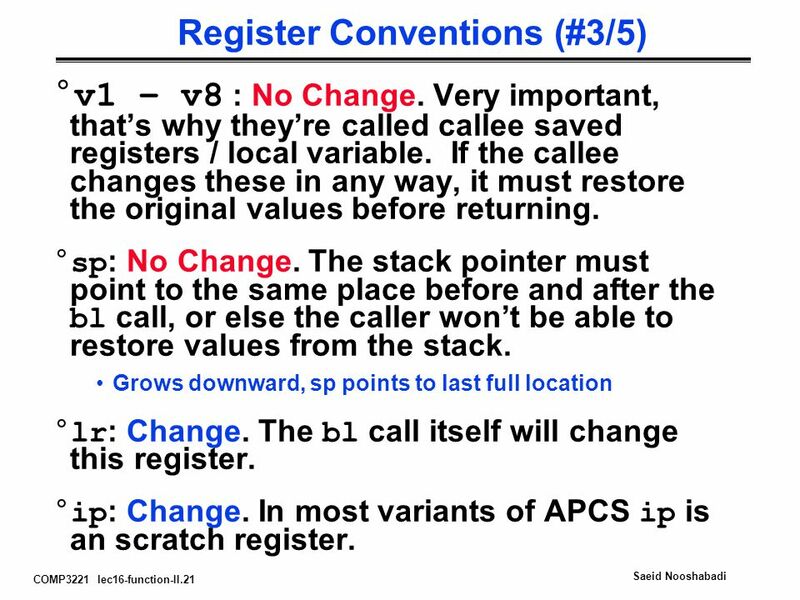 °Register Conventions: A set of generally accepted rules as to which registers will be unchanged after a procedure call ( bl ) and which may be changed. 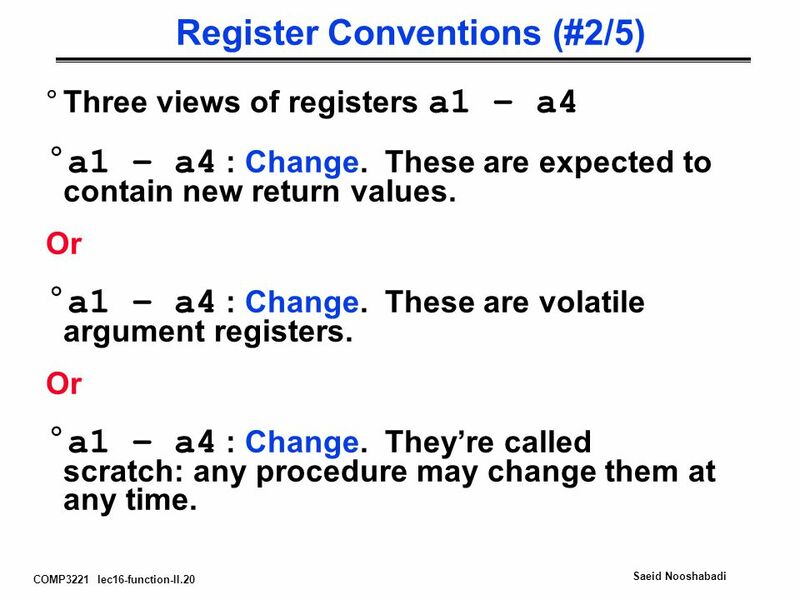 20 COMP3221 lec16-function-II.20 Saeid Nooshabadi Register Conventions (#2/5) °Three views of registers a1 – a4 °a1 – a4 : Change. These are expected to contain new return values. 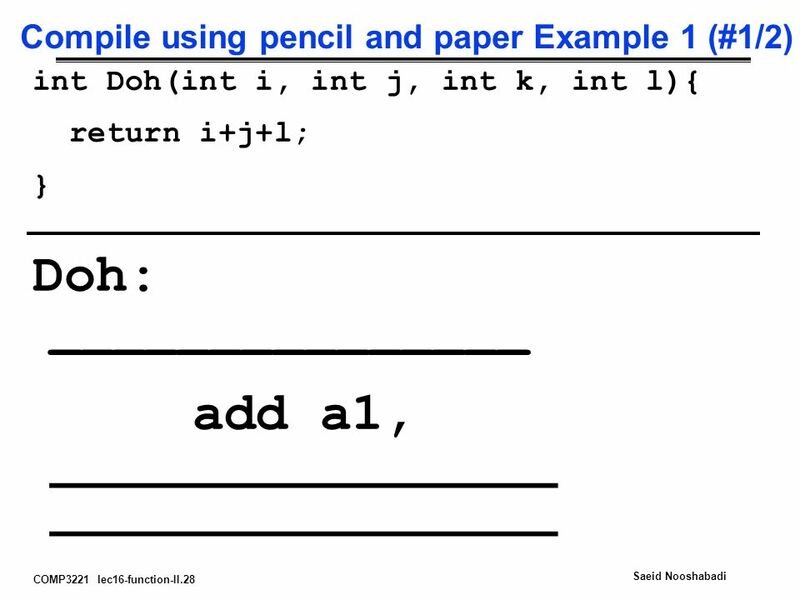 Or °a1 – a4 : Change. 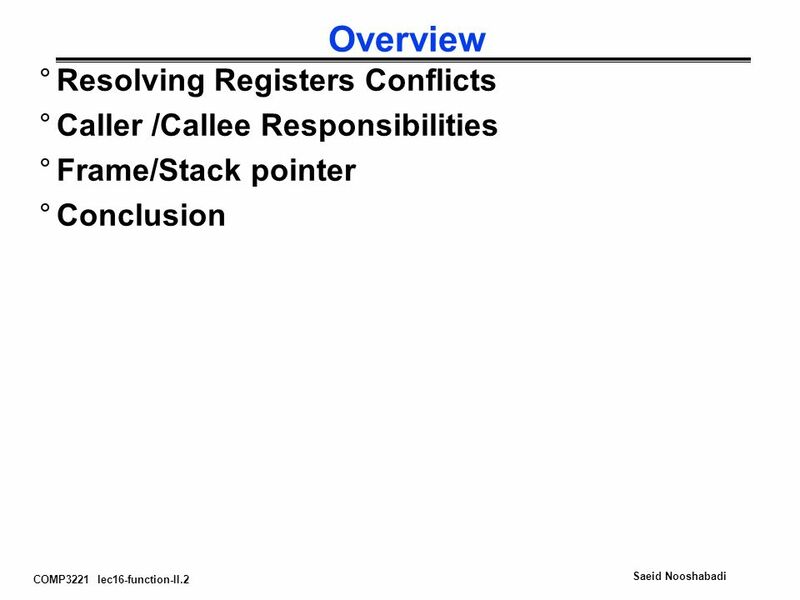 These are volatile argument registers. 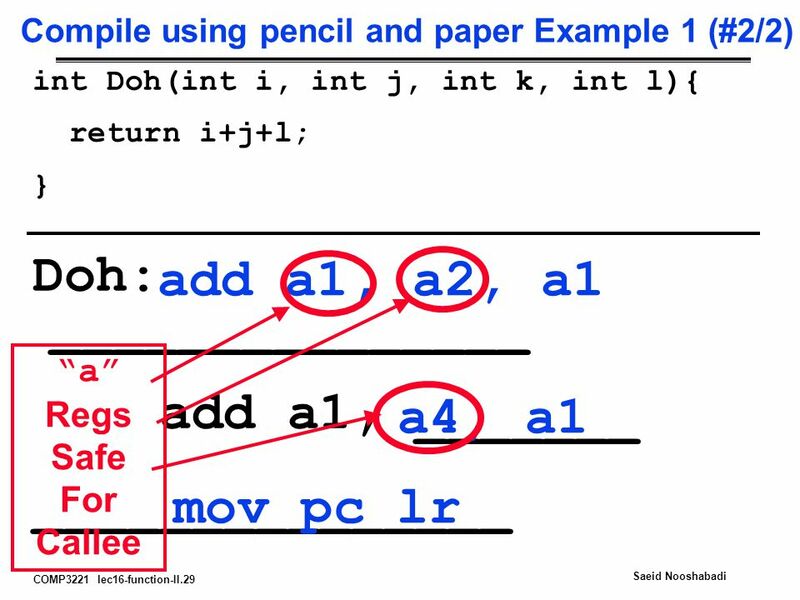 Or °a1 – a4 : Change. They’re called scratch: any procedure may change them at any time. 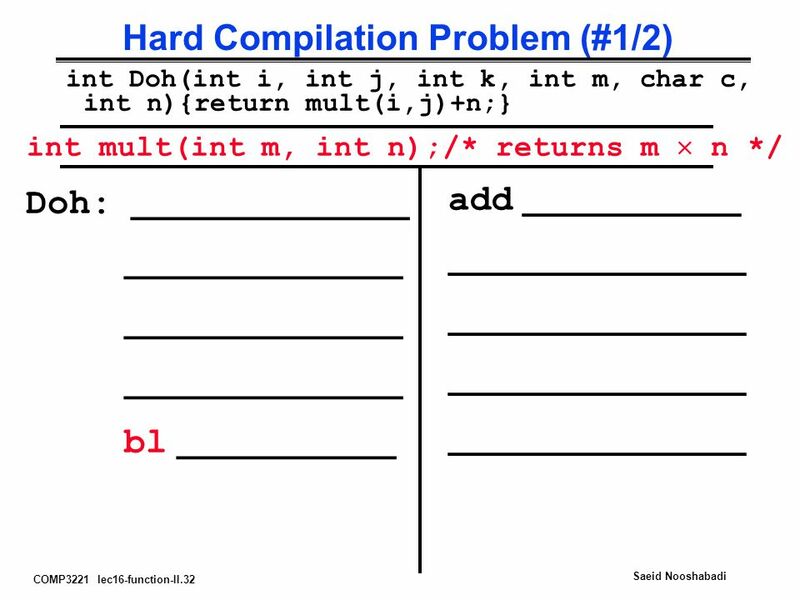 21 COMP3221 lec16-function-II.21 Saeid Nooshabadi Register Conventions (#3/5) °v1 – v8 : No Change. 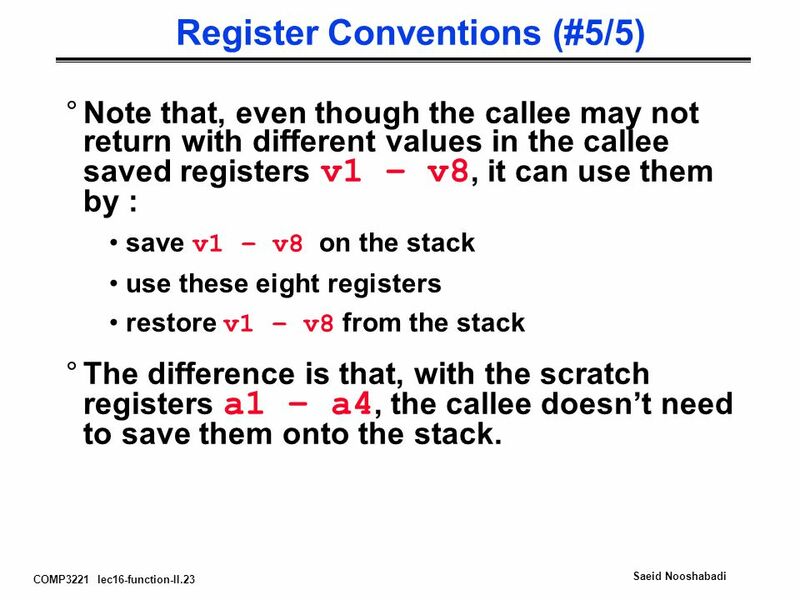 Very important, that’s why they’re called callee saved registers / local variable. 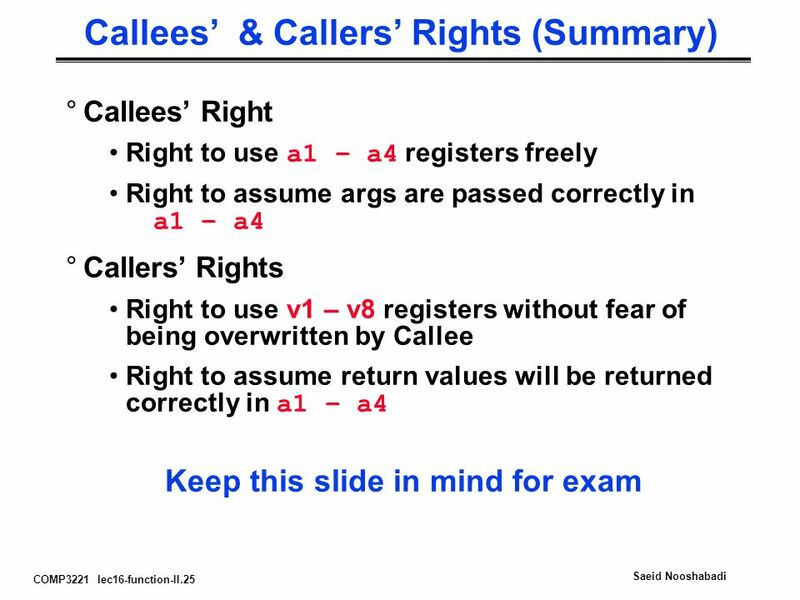 If the callee changes these in any way, it must restore the original values before returning. °sp : No Change. 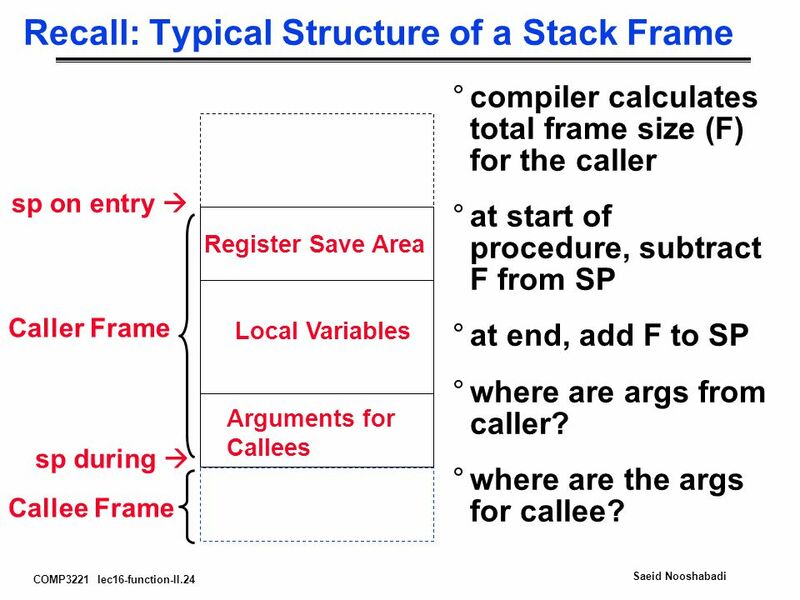 The stack pointer must point to the same place before and after the bl call, or else the caller won’t be able to restore values from the stack. Grows downward, sp points to last full location °lr : Change. 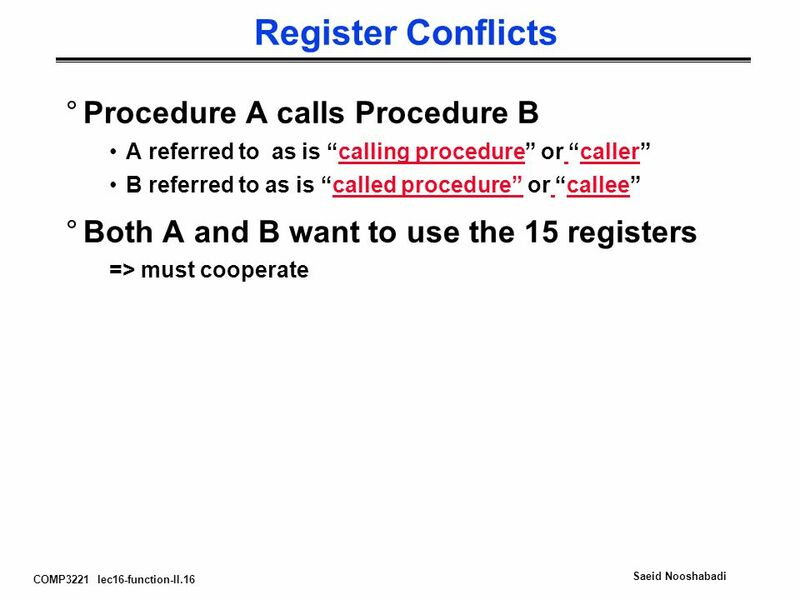 The bl call itself will change this register. °ip : Change. 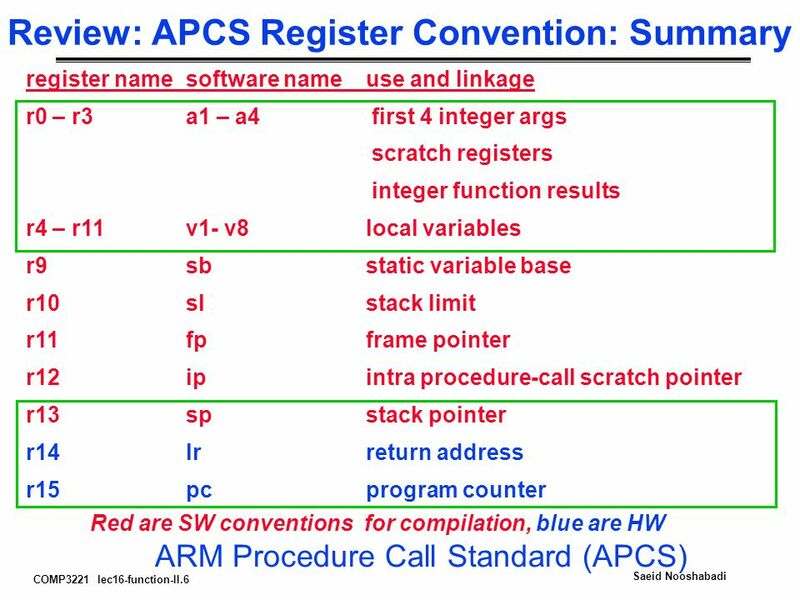 In most variants of APCS ip is an scratch register. 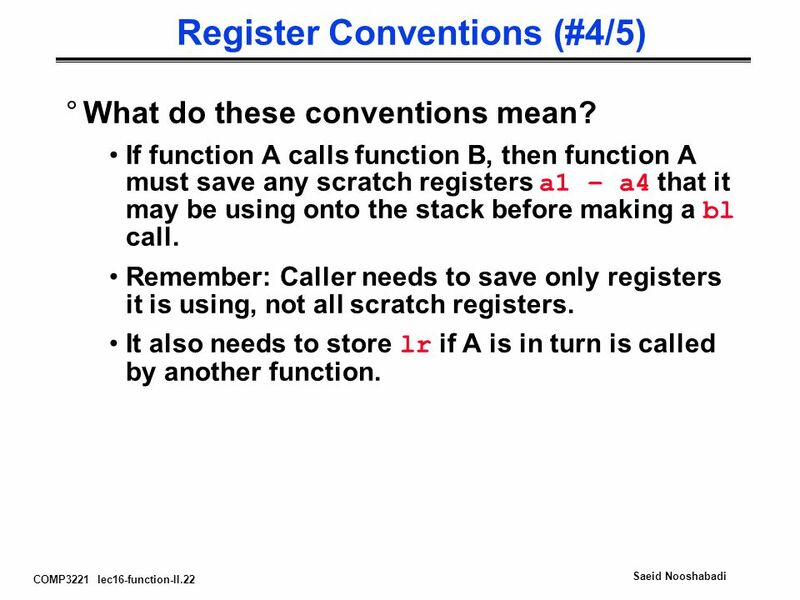 22 COMP3221 lec16-function-II.22 Saeid Nooshabadi Register Conventions (#4/5) °What do these conventions mean? 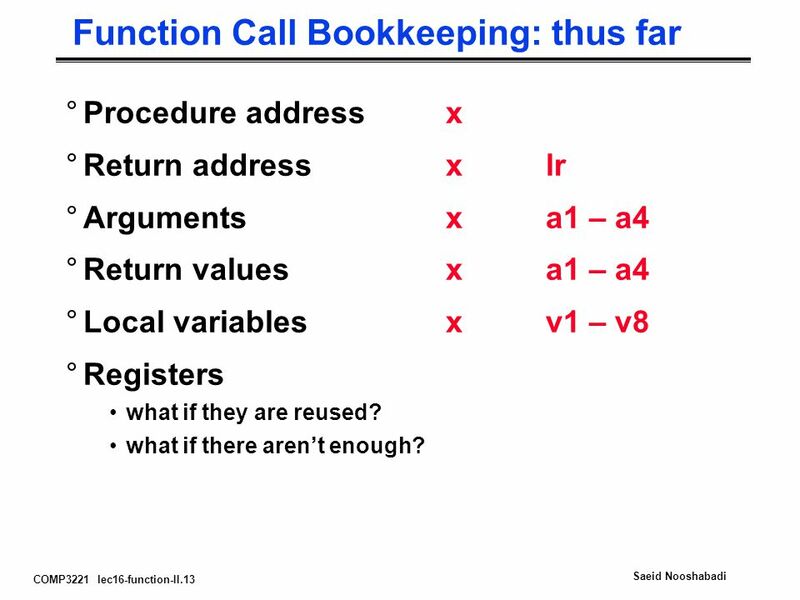 If function A calls function B, then function A must save any scratch registers a1 – a4 that it may be using onto the stack before making a bl call. 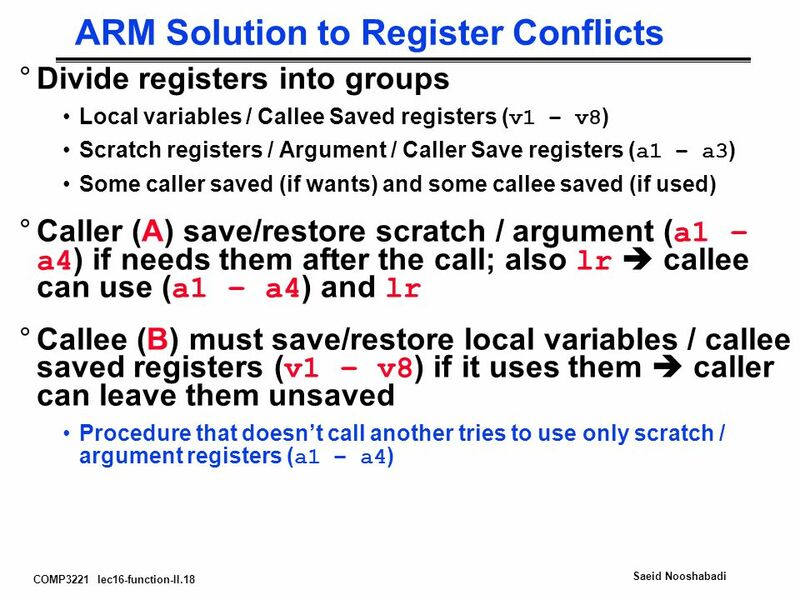 Remember: Caller needs to save only registers it is using, not all scratch registers. 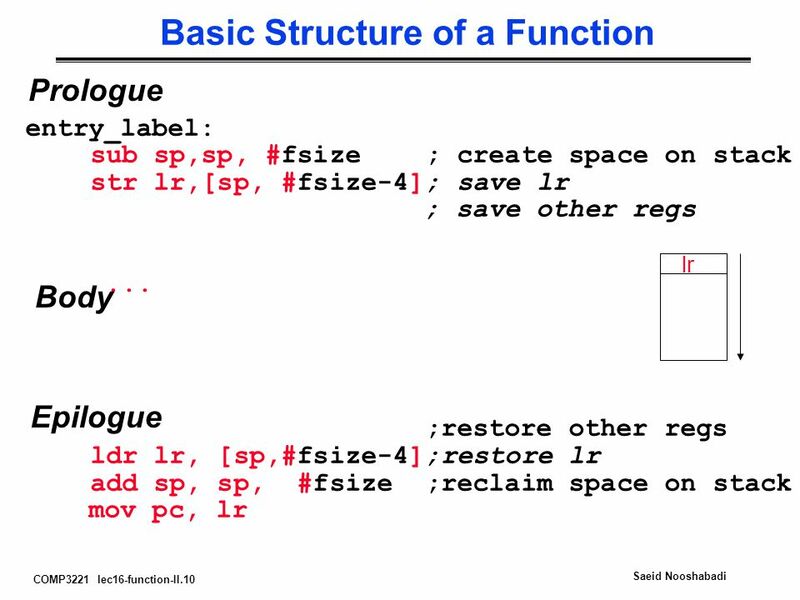 It also needs to store lr if A is in turn is called by another function. 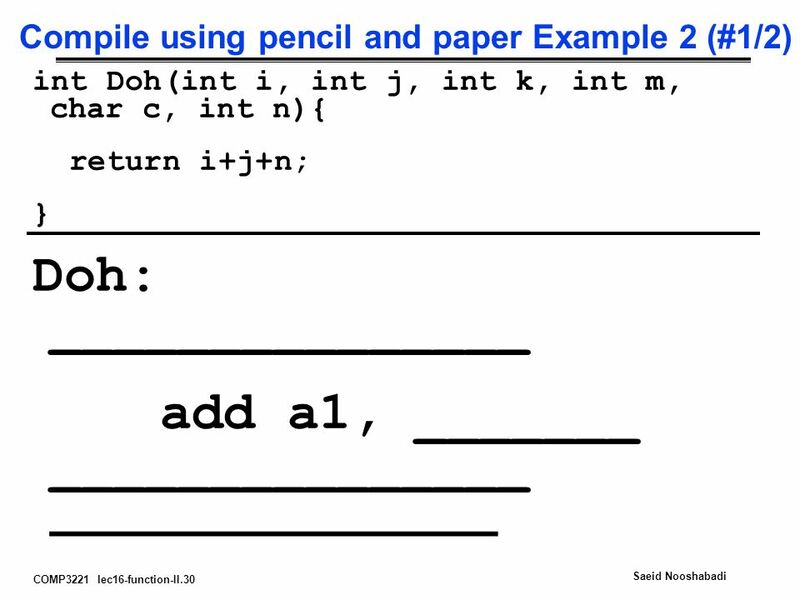 23 COMP3221 lec16-function-II.23 Saeid Nooshabadi Register Conventions (#5/5) °Note that, even though the callee may not return with different values in the callee saved registers v1 – v8, it can use them by : save v1 – v8 on the stack use these eight registers restore v1 – v8 from the stack °The difference is that, with the scratch registers a1 – a4, the callee doesn’t need to save them onto the stack. 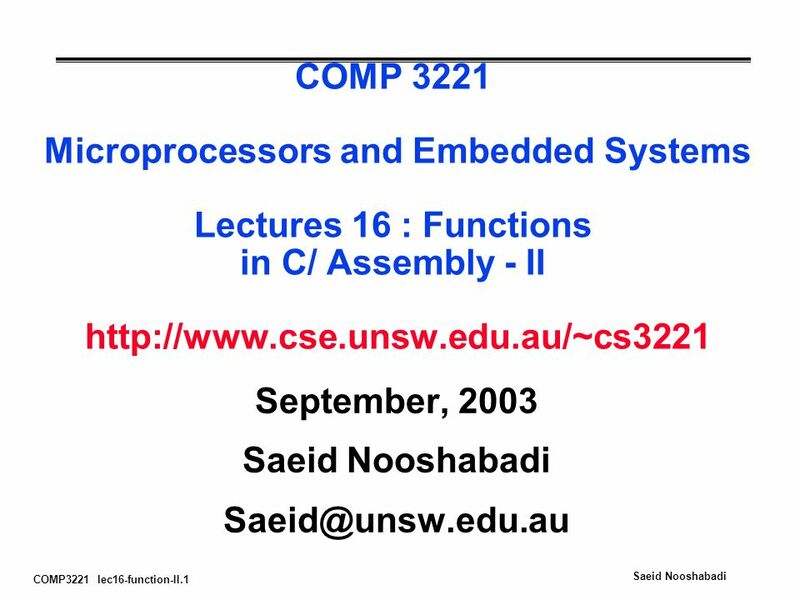 Download ppt "COMP3221 lec16-function-II.1 Saeid Nooshabadi COMP 3221 Microprocessors and Embedded Systems Lectures 16 : Functions in C/ Assembly - II"
Slides revised 3/25/2014 by Patrick Kelley. 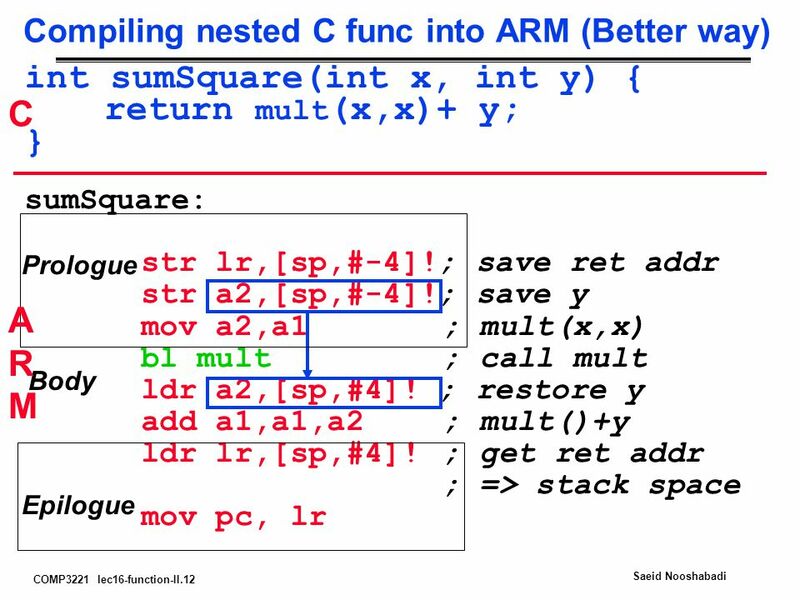 2 Procedures Unlike other branching structures (loops, etc.) 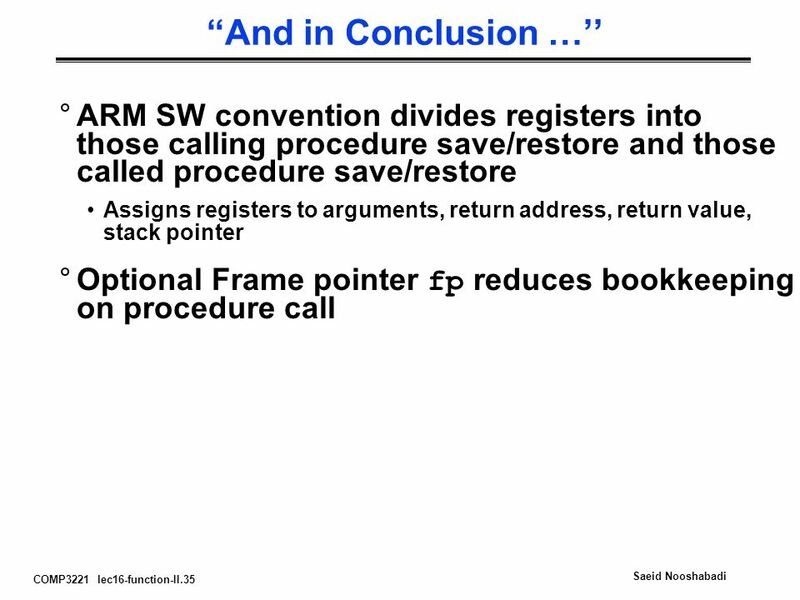 a Procedure has to return to where it was called. 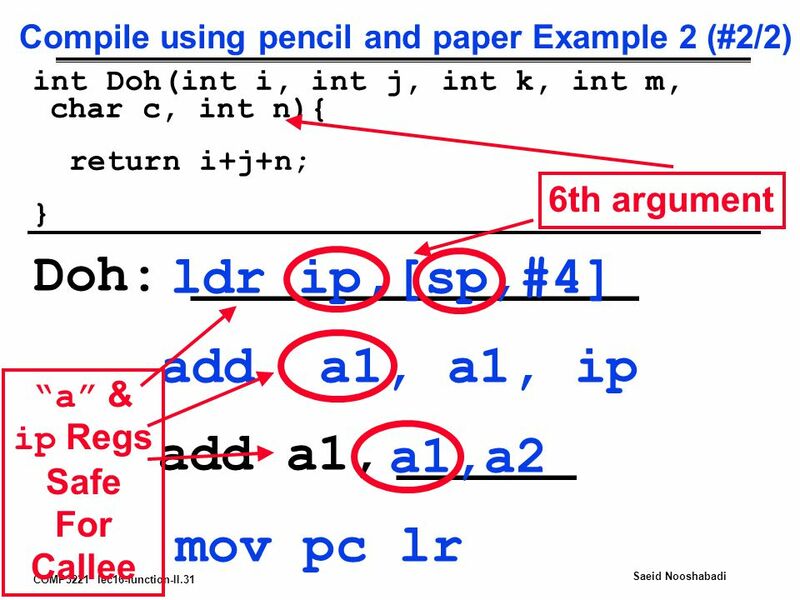 COMP3221 lec23-decode.1 Saeid Nooshabadi COMP 3221 Microprocessors and Embedded Systems Lectures 23: Instruction Representation; Assembly and Decoding. 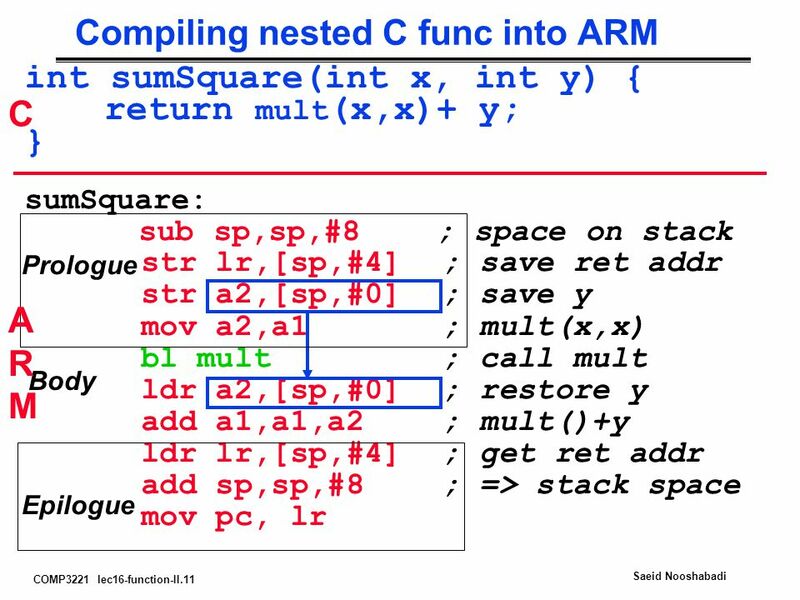 Introduction to Embedded Systems Intel Xscale® Assembly Language and C Lecture #3. 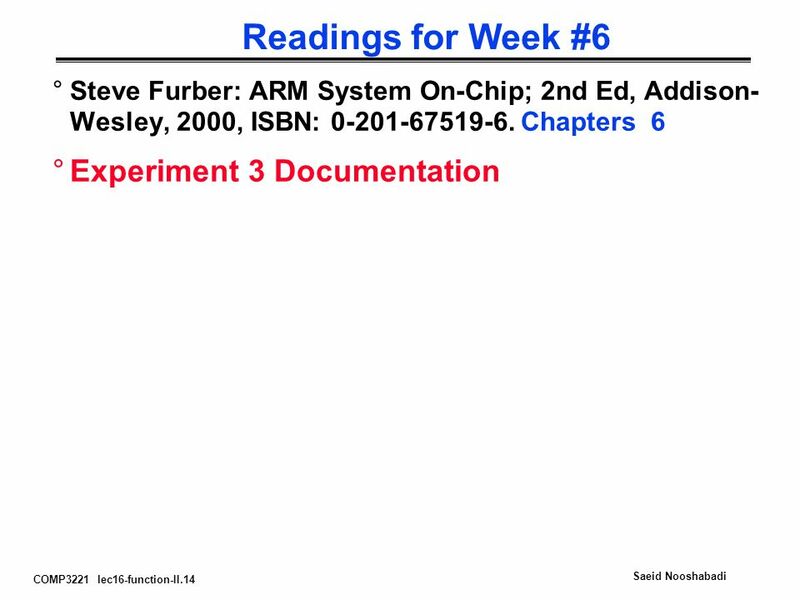 ECE 232 L6.Assemb.1 Adapted from Patterson 97 ©UCBCopyright 1998 Morgan Kaufmann Publishers ECE 232 Hardware Organization and Design Lecture 6 MIPS Assembly. 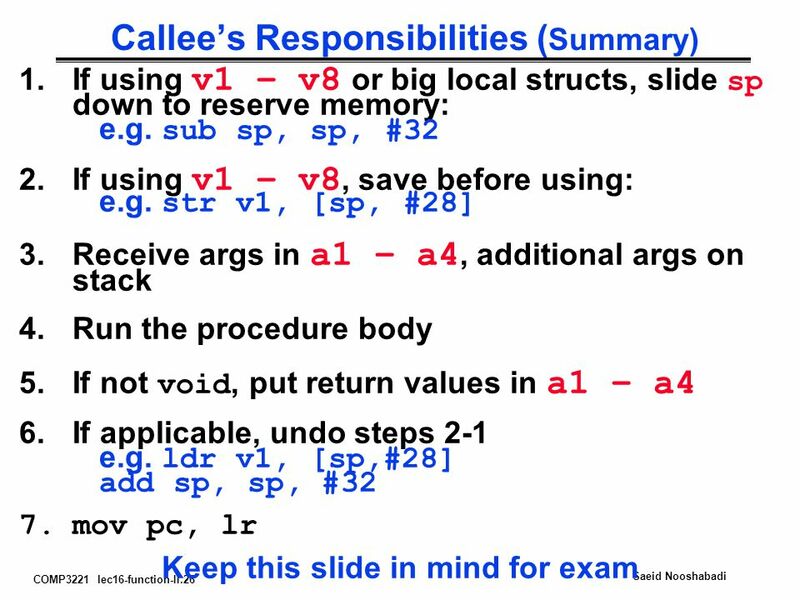 1 Lecture 4: Procedure Calls Today’s topics:  Procedure calls  Large constants  The compilation process Reminder: Assignment 1 is due on Thursday. 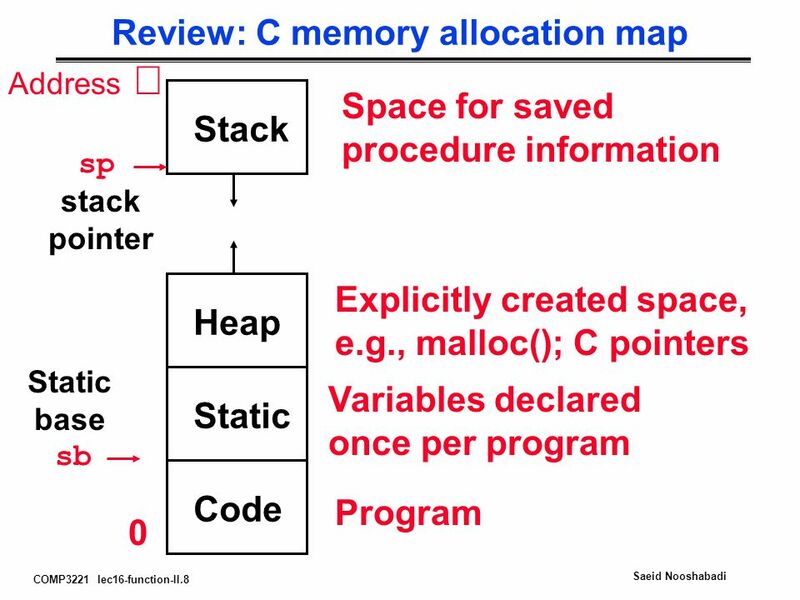 Procedure Calls Prof. Sirer CS 316 Cornell University. 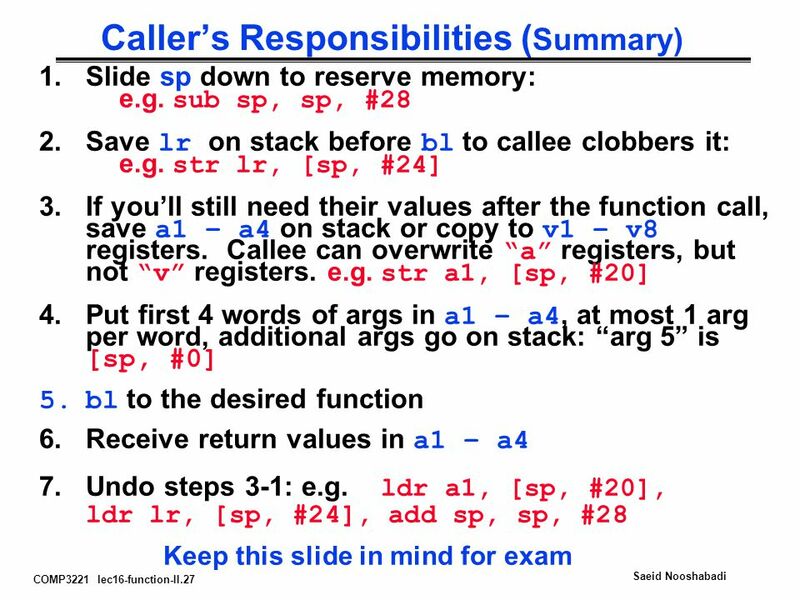 Lecture 6: MIPS Instruction Set Today’s topic –Control instructions –Procedure call/return 1. 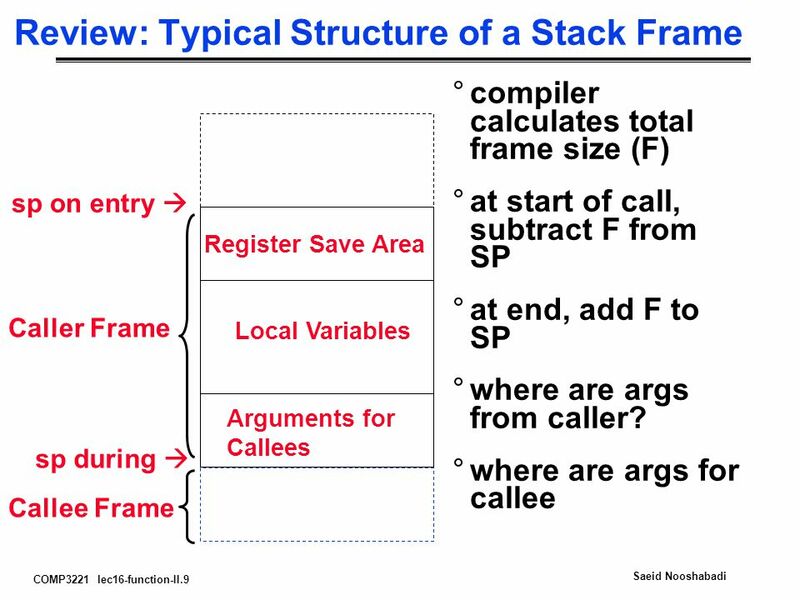 CPS3340 COMPUTER ARCHITECTURE Fall Semester, /17/2013 Lecture 12: Procedures Instructor: Ashraf Yaseen DEPARTMENT OF MATH & COMPUTER SCIENCE CENTRAL. Apr. 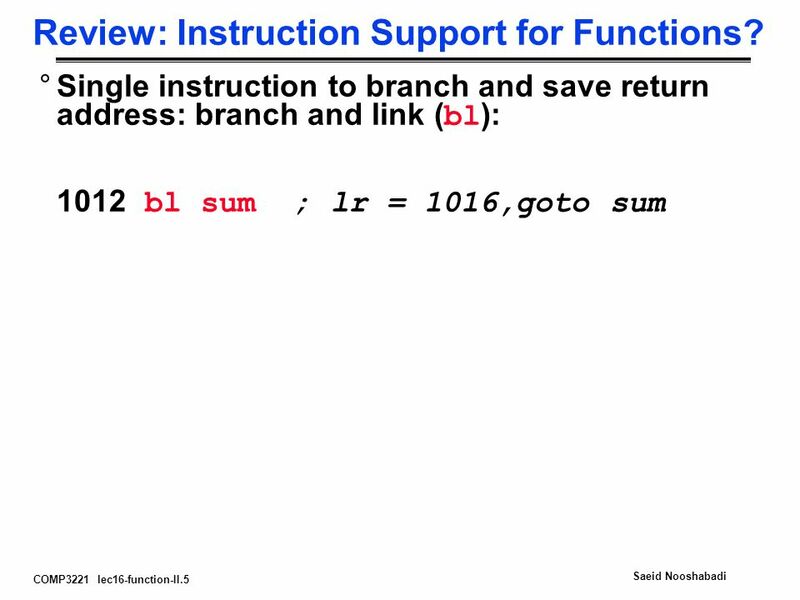 12, 2000Systems Architecture I1 Systems Architecture I (CS ) Lecture 6: Branching and Procedures in MIPS* Jeremy R. Johnson Wed. Apr. 12, 2000.